emmatree: And did you ever do this? 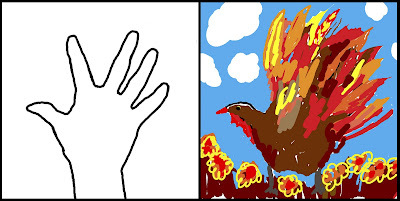 did you ever make Thanksgiving turkey decorations using your hand as on outline? assuming she had, assuming that this was just one of those things all teachers taught. She'd never heard of it, but she loved doing this. We sat around my mother's kitchen table & drew turkeys to celebrate the season. OMG! That is HILARIOUS!!! You are so bad!!!! I used to LOVE doing this, except for the part where I got ink on my hand instead of the paper (it's bound to happen). Thanks for the fun reminder! I never did this. And I don't believe my kids ever did this. Maybe it's a regional thing, but it's a fun thing. Your turkey is most festive. oh yes i did do that with my sisters and my grandma! is that yours or emma's? i like those fluffernutter clouds! Robin - Actually, this is my mother's! I never got to do this in school...not as far as I can remember anyways, but I do remember lots of other turkey projects in the fall. Remember Valentine's Day boxes? How wonderful were THEY?